Imagine all the amenities of a spacious contemporary home, while offering the benefits of maintenance free living. 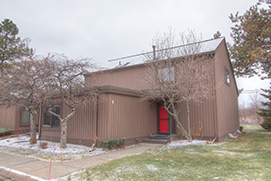 This end unit is located in the prestigious Northbury Condominium community on Ann Arbor’s popular north east side. This condo features oak hardwood flooring, an open floor plan and a great room with a vaulted ceiling. A dining nook included in the great room makes this space perfect for entertaining. Easy access through the glass doors lead to the private deck, which over looks a park like setting. 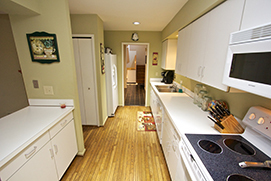 The updated kitchen is white and bright, and is open to the rest of the home. A large pass through island is such a convenience. A formal dining room is also on the first floor, access to the deck from this room is also perfect for entertaining. The first floor is completed by a master suite with a walk-in closet and private bath. The upper level has two other bedrooms and a main bathroom. A third room upstairs could be used as an office, library or fourth bedroom. It opens to the great room below. The lower level in this unit is professionally finished for extra space. A media room and lots of storage abound! New updates include: furnace, A/C, insulation and neutral paint. This is a well established community on the bus line just minutes away from hospitals, schools, parks, shopping and fine dining. Association fees include basic cable, outside maintenance of buildings and lawn care. Put this one on your list! This piece of Ann Arbor real estate won’t last long!